Here, the transporter is a contractor who engages in the business of transport i.e., plying, hiring or leasing goods carriage. From FY 2009-10, w.e.f 1st Oct 2009, no TDS deduction is to be made on payments made to Transporters if the payment is made u/s 194C and the transporter has provided valid PAN. This clause has been further amended in Finance Bill 2015 as No TDS will be applicable to the payment made in the nature of transport charges made to an contractor who is engaged in the business of transport i.e., plying, hiring or leasing goods carriage and who is eligible to compute income as per the provisions of section 44AE of the Act i.e., a person who is not owning more than 10 goods carriage at any time during the previous year and who has also furnished a declaration to this effect along with his PAN. This is w.e.f 1st June 2015. First, enter the transporter details in Deductee Master under Master menu. Enter the transporter details with validating the PAN and tick the option “Is transporter with 10 or less vehicles?”. Only the transporter with Valid PAN & enabled with the above option will be eligible for Zero TDS Deduction. After entering the deductee details, go to Deduction Details of applicable Quarter under Form 26Q. Here, select the transporter and enter the payment date and amount. Enter the tax rate as “0”. Once the entries are done, specify the Remarks for Deduction as Transporter with Valid PAN (0%). After entering all the required fields, save the details. Even though the TDS deduction for Transporter is Zero, we need to link this deduction with any paid Challan. Hence, after making the payment of Challan for the quarter (other deduction payments), enter the details of the Challan in the Challan Details window, of the particular Quarter and click on Link Ded option. On clicking Link Ded, the deductions which are not linked to any Challan will be displayed (including Zero TDS deductions). Select the required deduction and click on Link. Click on Yes to confirm the linking process and close the window. 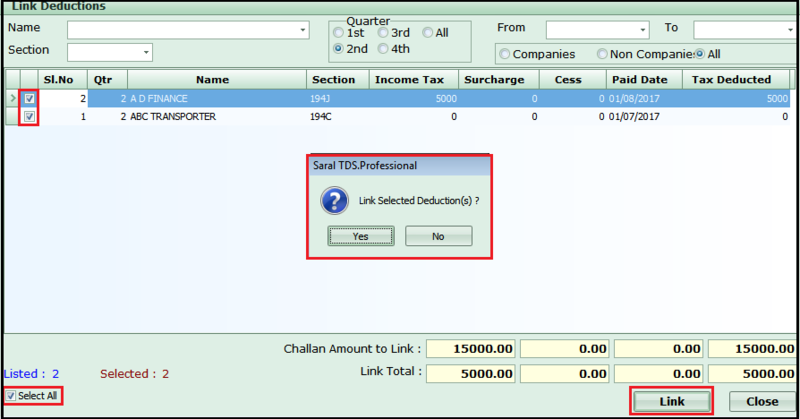 Once you link, click on Save and the deduction is linked to the particular Challan. The Challan used for the link process does not require any balance amount as the TDS deducted is Zero. In case, no Challan is available in the particular quarter, a paid Challan of the previous quarter can be used.